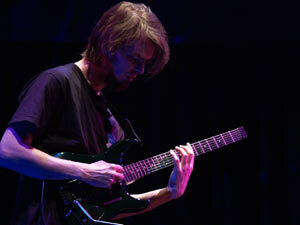 Born in 1972 and raised in Vienna, Austria, Alex Machacek is equal parts guitar virtuoso and prodigious composer. I had the pleasure of reviewing Machacek's latest CD 24 Tales in an earlier post and was instantly amazed by his fluid guitar playing and immense compositional depth. Alex Machacek is definitely a force to watch. In this interview, Alex talks about his various recordings, his compositional process, and gives us a rundown of his current gear as well as a glimpse of projects to come. He also tells us about how difficult it is for musicians like himself to continue to produce recorded works and even a guitar instruction DVD, in the face of rampant online file-sharing. The Guitar Column: You're originally from Austria, a city renowned for producing great classical composers. What was your early musical education like? Alex Machacek: I started out taking classical guitar lessons at a local music school. Beside the lessons I also had to attend theory classes and choir. TGC: I first came across your name some years back when I was doing a YouTube search for Charlie Parker's 'Donna Lee'. My first reaction was 'Machacek -- what an unusual name'. TGC: My second reaction upon watching your video was me almost falling out of my chair! I love the way you played the melody, expanding and compressing the time like a rubber band -- very Frank Zappa! Was that video from a guitar clinic you did? The video is from a record store in Raleigh – I played a couple of songs there to present my then new album [sic]. TGC: Coming to the US, you spent a couple of semesters at the Berklee College of Music. What was that experience like? TGC: Since then you've recorded with a number of great, like-minded musicians. Tell us a bit about your CDs, [sic] with Terry Bozzio and Improvision with Jeff Sipe and Matthew Garrison. AM: [sic] was my first album on Abstract Logix and there are different line ups on it. The pieces with Terry are recompositions around his drum solos, the other songs are in a regular band setting. The line up for Improvision was Souvik Dutta’s idea (Abstract Logix president). I knew that we wouldn’t have much time in the studio so we basically just jammed. I then took the material and composed around it at home. It was definitely a pleasant experience – Matt and Jeff are great musicians. TGC: You seem to favor touring in a trio format. Do you still have your trio with Kai Eckhardt and Marco Minnemann and will there be any live CD releases from those tour dates? That trio (with Eckhardt and Minnemann) is not a current one. TGC: Your newest CD '24 Tales' is based on an interesting concept. Marco Minnemann pre-recorded his drum parts and you structured and composed your guitar, bass and keyboard parts around it. I especially dig the way you composed around his drum fills and gestures, making it sound cohesive and compositional, especially when Marco does these abrupt rhythmic left turns. But there are some really hip modern jazz piano improvisations on 24 Tales as well. Are you as adept at keyboards as you are at guitar? AM: Sure, with my mouse on the computer! I can’t play the piano, but I know what I would like to hear so I just put it into my sequencer with the mouse – note by note. TGC: I'm curious, how much time does it take you to complete a massive compositional undertaking like 24 Tales? AM: I didn’t do it in one run, so it is hard to say – I started years ago but I got interrupted with other projects quite often – so I can only guess – many months? TGC: Your CDs are on the Abstract Logix label. How did your association with Abstract Logix come about? AM: My affiliation with Abstract Logix actually started by Shawn Lane recommending me to Souvik Dutta. He heard my first CD 'Featuring Ourselves' and seemingly liked it. Back then Abstract Logix was just a distribution company. I was still living in Vienna, Austria and received an email from Souvik expressing interest in distributing my CD. Later on, when I already moved to Los Angeles, Souvik and I kept in touch quite a bit and one thing led to another. Souvik founded his label and asked me if I wanted to release the CD I was working on ([sic]) on his label. TGC: You're also an instructor at the Musicians Institute in Hollywood. How do you manage your time between teaching, recording and touring the world? AM: I only teach 2 days a week and if I have to go on the road then I take a leave of absence. TGC: I've got to ask you, you have a really strong fluid legato technique but you're also very adept at alternate picking. Most guys are specialists at either one or the other. How did you develop both techniques to such a high level? AM: Don’t let yourself be fooled, my picking technique isn’t really good – I am definitely better playing legato. TGC: Watching your Pentatonic Concepts DVD from Lick Library -- a great instructional DVD by the way -- I noticed how positively relaxed your left hand is on the fingerboard. Most times it looks like you're hardly moving it at all! AM: Well, I definitely am working on efficiency and try to play with minimum effort. TGC: Do you have any new instructional DVDs in the works, or a guitar book maybe? AM: I had plans to write a book but (now) actually, no. Nowadays people just steal my stuff and therefore I don’t have much incentive to work on it. So far, the amount I earned with that DVD is just pathetic. I see it for illegal download all over the internet. I don’t want to come across as greedy or being only in it for the money, but keep in mind that there is a lot of work involved creating educational material. I do like teaching, but I do like playing and composing even more. Therefore I rather work on new music -- which people also steal shamelessly. TGC: What are you using these days by way of guitars, pedals and amps? AM: My main guitar is a custom guitar built by Bill DeLap, headless, chambered SG-style body. For my amp I'm using a Boogie Rectoverb with a Port City 2x12 cabinet. For effects, either I am using the (Fractal Audio) Axe FX Ultra with a midi footswitch, or sometimes I'll use my mini pedal board which consists of a Volume Pedal, Keeley compressor, X-otic BB Preamp, M-Audio Crunchbox, EWS modded Aria Chorus and Line6 DL4. And depending of the band I also use a Roland guitar synth -- GI 20 (midi guitar interface) with a XV2020 sound module. TGC: What do you bring in your touring rig, considering the strict baggage rules airlines have these days? AM: Either the Axe FX in a soft rack, usually as a carry-on, or the mini pedal board in a hardshell case, checked-in. And of course only one guitar. TGC: Both John McLaughlin and Allan Holdsworth have praised your work highly. That must be quite a thrill coming from two masters who are true fusion pioneers! AM: Yes, I can (and should) die now! TGC: Thanks so much for doing this interview Alex! Do you have any parting words for our readers? AM: I already mentioned it before but I have to say it again. Illegal downloads kill music! There seems to be a new generation growing up not even knowing that music is not free. So spread the word...even musicians have to pay their bills. And one thing that really annoys me is the whole 'sharing' discussion. The ones who are so much for sharing are usually the ones who don’t give but just take. But enough of that, we will see what the future will bring. On another note I would like to mention that I do have a new CD coming out in the fall. The band is called FAT which stands for Fabulous Austrian Trio. The band is with Raphael Preuschl on bass and Herbert Pirker on drums. Both of them already made an appearance on [sic] and they are simply great.